Tim Jennings reacts to breaking up a Rams pass. It wasn&apos;t pretty on offense but the Bears looked ageless on defense with the 23-6 win over the St. Louis Rams and are now 2-1 for the season. If ever a team needed a win after ten long days of hearing about their loss at Green Bay, it was the Bears. The seven rotating Bears defensive linemen came at Rams quarterback Sam Bradford in waves. They recorded six sacks and came at every direction. The unit held the St. Louis offense to 160 total yards. This was supposed to be an over-the-hill defense, but they continue to play well in tandem. One of those veterans, nine-year defensive end Israel Idonije (he had 2 ½ sacks) doesn’t see age as a problem for this Bears defensive unit. “For us internally, age has never been an issue,” said Idonije. "We know the work ethic of our guys, the drive, the mentality of the guys — all that old stuff is from the outside.” Idonije and 11-year veteran Julius Peppers are getting plenty of rest in between plays and the youngsters Stephen Paea and Sean McClellin are learning and improving with the elder players. 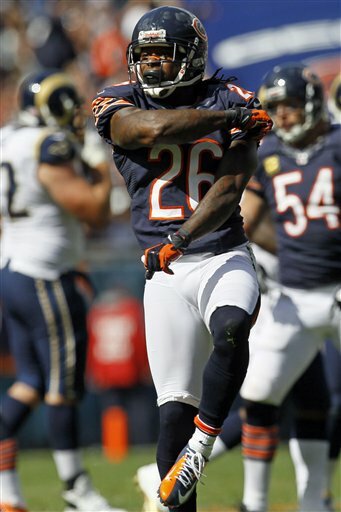 With the pressure on the Rams passing game, it allowed the Bears secondary to force two key interceptions. Of course, it was cornerback Tim Jennings involved with both picks; he tipped a pass to Bears safety Major Wright in the fourth quarter to deny St. Louis a chance to score. Jennings then grabbed an interception in the waning minutes of the game to help seal the second Bear win of this young season. Jennings has played in the league for seven years and is enjoying his best output in the first three games of the schedule. “I feel good. My health is the best I have ever felt. We play in a good defense and the coaches gives us the confidence to fly around,” said Jennings. He already has four interceptions (at least one in each game) and has been instrumental in many key plays in the Bears’ secondary. Jennings and Wright both give plenty credit to the players up front for giving them the opportunities to cause the turnovers. The offense did enough to win — there are no bawdy numbers like in the season opener against the Indianapolis Colts. It wasn’t the train wreck like in Green Bay. Jay Cutler was just OK, his numbers are not memorable. Cutler had no touchdowns and one interception to All-Pro Cortland Finnegan, Devin Hester couldn&apos;t handle Cutler pass that was a sure TD in the corner of the endzone. Cutler wasn’t surprise the way the game played out. “We’re not going to come out there every game and blow the doors off offensively, defensively and on special teams every week. This is a normal NFL football game," he said. The offensive line protection all OK, giving up two sacks. The line still had some poor penalties — two false starts from Chilo Rachal in his first Bears start at left guard. Cutler was sacked only two times. Michael Bush handled the duties in the backfield for injured tailback Matt Forte. He was credible, with 74 all-purpose yards and a touchdown. The best scoring came from the foot of place kicker Robbie Gould. He hit field goals of 54, 37 and 22 yards. When you think back at the beginning of his NFL career with the Bears, anything over 40 yards wasn’t even attempted. With the Bears offense not capitalizing enough on the red zone, Gould will be counted on to tack on the points this season until Cutler and company rectify their issues. After the game Head Coach Lovie Smith wasn’t worried about the offense not operating on all cylinders to him. “I was happy with the game. It’s pretty simple guys. When things don’t go well, we’re going to be really unhappy,” he said. “But when you find the way as a football team to win the game, we are going to enjoy that first and then go back to the field and correct those things.” The Bears have some time again to make changes again. They have an extended week since they are idle until next Monday when they travel to Dallas to play the Cowboys. Luckily this long week will feel a whole lot better than the previous week.